Each player claims an adorable dog house. Create a game path with the 10 extra-sturdy game squares. Move the plastic puppy along the path - when you land on a space that features the dog in your dog house, you collect dog bones. As the puppy moves, so does the game path, so it never ends - and it's different every time you play! 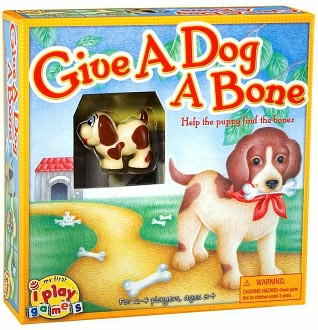 When all the dog bones are collected, the player with the most is the winner. Contents: 10 game cards to form path, 4 dog house game boards, 1 plastic puppy dog, 12 plastic bones, 1 die, Game rules. For 2-4 players. For ages 3 and up.